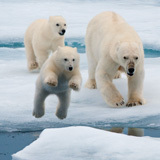 In the United States, ozone-depleting substances (ODS) are regulated as class I or class II controlled substances. Class I substances have a higher ozone depletion potential and have been completely phased out in the U.S.; with a few exceptions, this means no one can produce or import class I substances. Class II substances are all hydrochlorofluorocarbons (HCFCs), which are transitional substitutes for many class I substances. New production and import of most HCFCs will be phased out by 01/01/2020. The most common HCFC in use today is HCFC-22 or R-22, a refrigerant still used in existing air conditioners and refrigeration equipment. R-22 has been the dominant refrigerant in residential, commercial air conditioning, and large chillers for industrial process cooling. R-22 is subject to reduced importation, and new (virgin) production each year. On January 1st 2020, R-22 will no longer be produced or imported and only, Recovered or Recycled, or Reclaimed supplies of R-22 will be available. The production and importation of R-22 is already being phased out. Owners are not required to stop using R-22 or to replace existing equipment. The phase out period allows owners to maintain equipment and provides the time to switch to ozone-friendly refrigerants when maintaining their current system is no longer cost effective. Without the implementation of the reclamation process R-22 supplies will be completely depleted. The Final HCFC Allocation Rule impacting the amount of virgin R-22 refrigerant that can be produced and imported went into effect January 1, 2015. 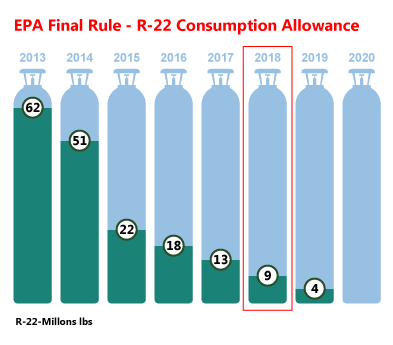 This is the last set of R-22 annual allowances for the 2015-2019 timeframe before reaching zero in January of 2020. In 2017, the R-22 allowance was 13 million pounds. This is 28% less than the 2016 allowances. In 2019 R-22 allowance will be 4 million pounds. For more information visit PhaseOutFacts.org use this link for your source for information about the U.S. strategy to phase out the use of ozone depleting refrigerants in central air conditioning and commercial refrigeration equipment, the next generation of refrigerants and the responsible use of the chemicals. Refrigerant that was removed from refrigeration or air conditioning equipment and stored in an external container WITHOUT necessarily being tested or processed in any way. Reuse is restricted to the system that it was recovered from, or in any other system owned by the same equipment owner. Refrigerant that has been extracted and cleaned for reuse WITHOUT being tested for compliance with the stringent AHRI Standard 700 purity specifications required for reclaimed refrigerant. Reuse of recycled refrigerant is restricted to the system that it was recovered from, or in any other system owned by the same equipment owner; otherwise, it must be sent to an EPA-certified reclaimer to restore it to AHRI Standard 700 purity specifications prior to resale. Refrigerant that has been reprocessed using specialized machinery and tested to meet AHRI Standard 700 purity specifications. for use in new and existing refrigeration and air-conditioning products as required under 40 CFR part 82. [based on Air Conditioning, Heating, and Refrigeration Institute] (AHRI) Standard 700-2016. Chiller City's refrigerants are reprocessed and tested to AHRI 700 Standards by an independent third party Nationally Recognized Testing Laboratory (NRTL). Per EPA regulations and AHRI standards the reprocessing and testing procedures which Chiller City adheres to requires our refrigerants to be held to the same strict standards as manufacturers of new refrigerants. Neither the EPA nor AHRI standards requires the source of refrigerants to be labeled, "Reclaimed" or "New". The reasoning for this is that both reclaimed and new refrigerants are tested / verified to the same thresholds. This is documented with-in the EPA regulations and AHRI standards requiring laboratory's batch testing for both NEW (virgin) and Reclaimed Refrigerants. In order for Manufactures of refrigerant or refrigerant reclamation facilities to legally sell refrigerants in the United States all refrigerants must be batch tested. Purchasing refrigerant from Chiller City's refrigeration program is NOT DEPENDENT on you selling your refrigerants to us. Any reclamation facility that REQUIRES YOU TO SELL THEM REFRIGERANT TO BE ABLE TO PURCHASE REFRIGERANT is to try and control your company's bottom line. Chiller City NEVER REQUIRES you to sell us refrigerant to purchase refrigerant. We do not feel this is an acceptable business practice.